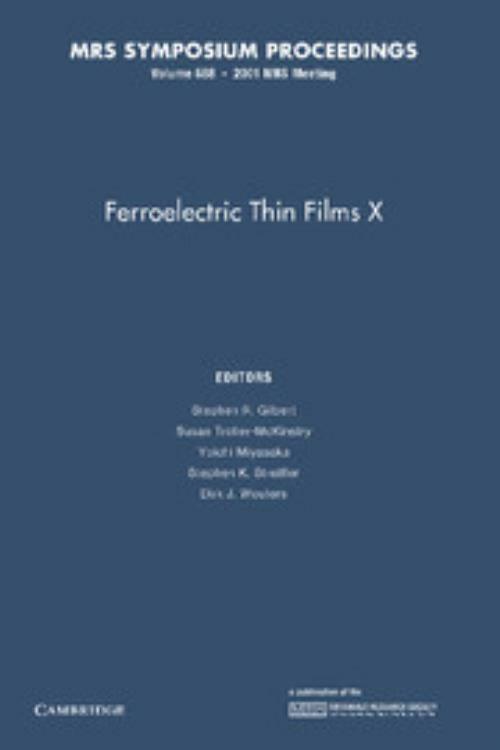 This book, the tenth in a highly successful series from the Materials Research Society, presents technical information on ferroelectric thin films from academia, government laboratories, and industry. Substantial progress in several areas of integrated ferroelectric and high-permittivity device technology are demonstrated. In particular, the latest developments in high-density FeRAM devices are reviewed, as are developments in the use of these films in piezoelectric, pyroelectric, tunable RF, integrated capacitor, and optical waveguide applications. Thin-film processing techniques used to deposit a variety of ferroelectric and electrode materials are also highlighted, and recent advances in the fundamental understanding of ferroelectricity and degradation phenomena in thin films are addressed. Topics include: processing of Pb-based ferroelectrics; processing of Bi-based ferroelectrics; ferroelectric nonvolatile memories - technology, fundamentals and integration; integration and electrodes; epitaxial ferroelectric films; domains and nanostructures; piezoelectrics and pyroelectrics; ferroelectric gates; thin films for RF applications and high-permittivity materials. Yoichi Miyasaka NEC Corporation, Tsukuba, Japan.